In the entertainment industry, the act of receiving a paycheck works a bit differently than in most other fields of business. Unlike normal jobs, where an employee acquires their payment after work is completed, actors, writers, directors and others get a check any time the movie or television show to which they contributed is rebroadcast, purchased on DVD/blu-ray, or used on other occasions. 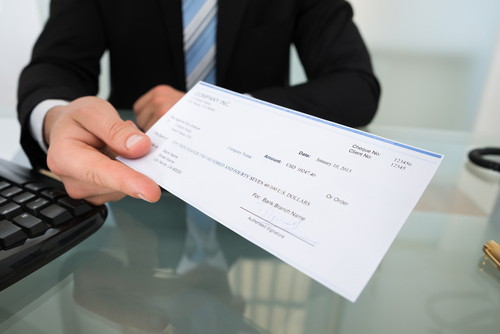 The term for this specific type of payment is called a residual, or royalty. Often times, entertainers will depend upon this money when they’re in the process of locating their next job. The system was developed during the dawn of television in the 1950s, where the young industry copied the idea from the radio. In 1960, after a strike, the Screen Actors Guild (SAG-AFTRA) successfully negotiated with film producers, and an agreement was formed where residuals would be sent out when movies were aired on TV, in addition to episode re-runs. The check even inspired the name of a Studio City, California, bar, Re$iduals, which opened in 1986, and accepts residuals checks for less than $1 from customers in exchange for an alcoholic beverage. Employees are required to work in show biz. According to the Writers Guild of America (WGA) “Residuals Survival Guide,” there are normally two versions of calculations made to determine residual amounts - “revenue-based,” where the credited writer receives a percentage from the company based on receipts, and “fixed,” which relies on various factors, including the product type, length, budget and employment contract. The Directors Guild of America (DGA) ratified a new contract in February 2014; under the DGA Basic Agreement, members receive 1.2% of distributor’s gross for pay-TV redistribution and rebroadcast. For actors and members of SAG-AFTRA, the amount of compensation they receive tends to be a percentage of the distributor’s gross as well. Accurate TV metadata is of the utmost importance when it comes to residuals, as studios analyze and verify the information to determine when a program has aired, what regional market it aired in and who participated in the production. Many businesses depend on archival and historical data to ensure that checks are disbursed properly. When a metadata vendor fails to include the proper participant information, or television shows and movies are not correctly listed, that means that someone involved, like a cast or crew member, might not be receiving a paycheck, and perhaps one of the major reasons that accuracy and robustness of entertainment metadata is so important.